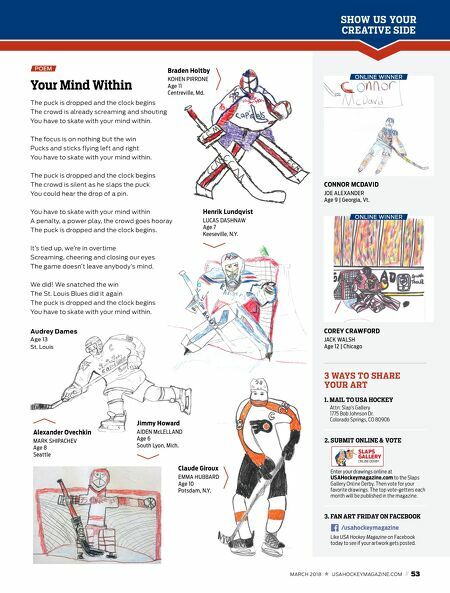 52 // MARCH 2018 USAHOCKEYMAGAZINE.COM S L A PS GA L L E RY Arizona Coyotes GRIFFIN BROWNE Age 10 Overland Park, Kan. Rocket Richard JOHN FABBRO Age 10 Hingham, Mass. Jaroslav Halak, No. 41 ERIC KOIS Age 11 Hopewell Junction, N.Y. Connor McDavid JOEY VALONE Age 13 Auburn, Mass. 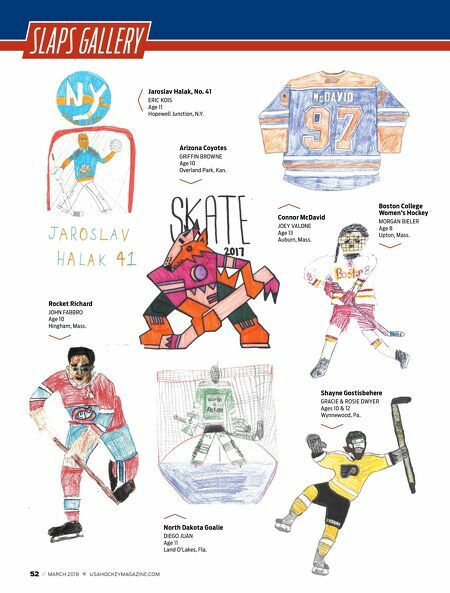 North Dakota Goalie DIEGO JUAN Age 11 Land O'Lakes, Fla. Shayne Gostisbehere GRACIE & ROSIE DWYER Ages 10 & 12 Wynnewood, Pa. Boston College Women's Hockey MORGAN BIELER Age 8 Upton, Mass.